Featuring almost 30,000 sq. 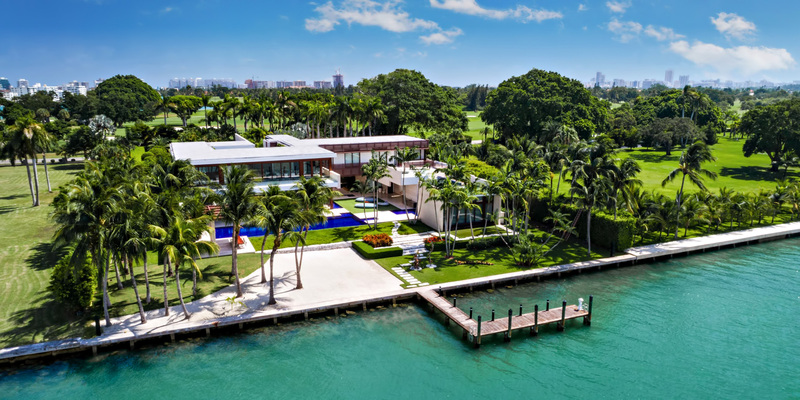 ft. of indoor/outdoor living space and 205 feet of wide bay frontage, this remarkable residence was conceived as a series of pavilions interlaced with lush gardens, water elements, and shaded pathways interconnecting with the expansive views of Biscayne Bay to create a living experience unmatched perhaps anywhere in the world. Featuring a 75-foot living room, this waterfront gathering, and entertaining space boasts 14-foot, German mahogany high-impact glass windows which slide open and access the spectacular terrace that overlooks the pool, the dock and the bay along with a large rooftop terrace with sky bar, plus a lawn area and Jacuzzi. The sensational master suite encompasses 3,000 square feet and includes a midnight kitchen, sleeping area, grand bath with his and her water closets and his and her walk-in closets, plus a full-length private terrace overlooking the pool and bay. This world-class residence will simply leave you speechless. From it’s curtains of water that cascade from a rooftop pool that transform from relaxing waterfall to a therapeutic aquatic massage, a full spa pavilion including a Chroma therapy spa, massage room, steam room and fully equipped waterfront gym, a 100-foot resort pool and poolside cabana with a private beach that has sand imported from the Bahamas, a 2,000 sq. ft. elliptical Koi pond with rare species fish that envelopes the residence's entrance, to state of the art security features such as a panic room and a wine cellar with fingerprint ID. There is truly no other residence in Southern Florida that offers the magnitude of this residence.